Formed and fabricated materials are value-added products made by processing raw materials into shapes similar to final products. Various shapes of formed and fabricated materials are widely used as semi-processed products for bearings and automobile parts. Sanyo Special Steel established a system to develop processing technologies with consideration given to the material properties, reflecting the CAE analysis technology in designs of dies and processes, and manufactures products ranging from high-cleanliness steel incorporating the high-cleanliness steel production technology to high-quality formed and fabricated materials by an integrated production process. Suitable for production of formed and fabricated materials for high-performance bearings intended for automobiles, airplanes and Shinkansen (bullet trains). Advanced die design is being developed by incorporating CAE analysis. Profile moldings of high yield are manufactured by vertical-type rolling machines. Various types of rings can be manufactured from stainless steel, heat resistant steel, tool steel, etc. The size can be set at 0.1 mm if cold rolled steel tubes are used. Roundness of the outer circumference depends on the size. 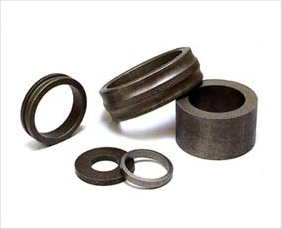 Thin rings and wide rings that cannot be produced by forging can be manufactured. Formed and fabricated materials for high-performance bearings, mainly used in automobiles, are manufactured by high-speed forging. Complicated ring-shaped formed materials are manufactured by the closed forging technology. Profile moldings of high yield can be produced by cold rolling.